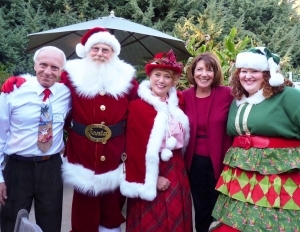 December 15, 2011 (La Mesa)—Thanks to all of our generous guests , sponsors, and VIP visitors who made this year’s East County Magazine holiday party very merry indeed! As always, we invited community leaders and officials in all parties, plus other special guests. Congresswoman Susan Davis (D-San Diego), whose district will soon include much of East County, joined the festivities. 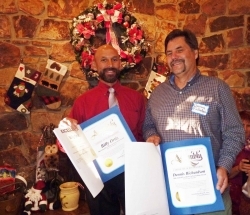 Assemblyman Brian Jones (R-Santee) sent Assembly commendations for our award-winning writers and photographers. 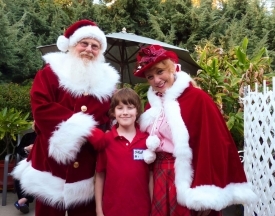 Santa and Mrs. Claus heard children’s Christmas wishes, while an elf handed out prizes. Johnny Depp double Sam Diego served as celebrity auctioneer, raising hundreds of dollars each for the East County Toy & Food Drive as well as East County Magazine. 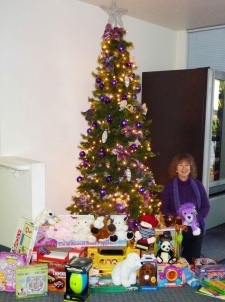 Plus our big-hearted readers brought dozens of toys to brighten this holiday season for local children in need. Other bipartisan VIP guests included David Secor, candidate for the 50th Congressional district seat currently held by Duncan Hunter, El Cajon Councilman Gary Kendrick, Lemon Grove Councilman George Gastil, and Pat Washington, candidate for the 79th Assembly District. Another special guest was Sam Warren, president of the San Diego Writers & Editors Guild and publisher of San Diego Write Way. Sam is moving to Nicaragua, and hopes to merge his wonderful publication with East County Magazine’s San Diego Bookshelf section in the New Year. Author/musician Anat Tour also dropped by. We offer our special thanks to jazz pianist Danny Green and the San Diego State University Adams Project Performers Network for providing wonderful music for our party. Our caterers did a fabulous job – please support these generous businesses, which donated 100 percent of the delicious food served: Alpine Submarina, Grove Bakery, and Zeytoon’s Persian & Mediterranean Restaurant. We also appreciate the delightful wines provided by La Serenissima Winery and San Pasqual Winery. You’ll find coupons for some of these companies in our Holiday Coupons section; watch for more to be added soon! 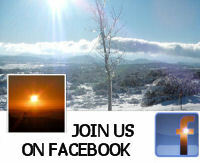 We’ll also be posting more photos as soon as we receive a CD being mailed from a photographer. In addition, ECM thanks our generous sponsors for donating some fantastic prizes that helped raise funds for both our nonprofit news service and the East County Toy and Food Drive. This year’s prize sponsors include the Viejas Band of Kumeyaay Indians, Cowgirl Bling, Nancy Clement, Mark and Miriam Raftery, Shaklee distributor Kelly Demassimo, author Anat Tour, Dollar-Wise Diva columnist Nancy Clement, Mission Trails Regional Park, and Sunbelt Publications. 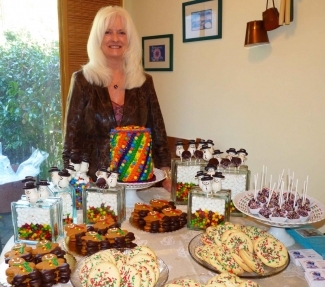 This year’s party was held at editor Miriam Raftery’s home on Mount Helix in La Mesa. Miriam extends her special thanks to the many writers, photographers, editors, videographers, interns, and community volunteers whose expertise, hard work and dedication have helped make our online news service so successful. We are also deeply appreciative to our growing number of sponsors and donors whose support makes our community news reporting and Viejas Wildfire & Emergency Alerts possible. If you missed the party, please consider an end-of-year tax deductible donation at www.EastCountyMagazine.org--and be sure to sign up for a free subscription, too, so you'll be on the invitation list for next year's celebration! To all of our wonderful readers, we wish you a very merry Christmas, happy Hanukkah, festive Kwanzaa, wonderful winter solstice and a joyous New Year—along with any other special occasions that you celebrate this holiday season.